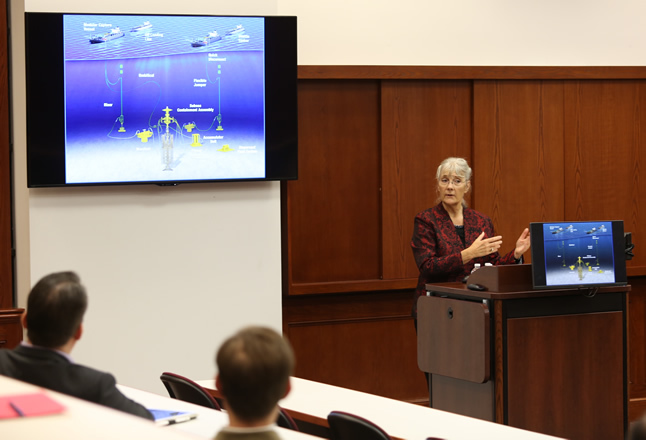 Professor Emeritus Jacqueline Weaver shares her thoughts on the "Role of the Regulator" in the oil and gas industry during a Reunion Weekend continuing legal education session at the University of Houston Law Center. Nov. 14, 2017 -- Alumni made their way back to the classroom with Professor David Dow and Professor Emeritus Jacqueline Weaver during the recent Reunion Weekend 2017 at the University of Houston Law Center. Weaver, an internationally known scholar in oil and gas law and energy law, delivered a presentation titled, "Role of the Regulator: Reflections on Forty Years of Research and Learning about Energy, Economics & the Environment." She said regulators need to set the standards of the industry and must be able to assess those standards before adopting them in regulations or guidelines. Despite no recent major accidents in the oil and gas industry, Weaver said regulators must hold the industry accountable to maintain safety. "After 40 years of my research, I basically decided the theme of it has been a good regulator is industry's best friend," she said. "If regulators do not act, litigation I assure you will fill the gap. "Ultimately, the regulator's goal is to combat industry's inevitable sense of complacency, and to force continuous improvement on the entire industry as increasingly complex technology and procedures advance," she said. Weaver taught at the Law Center for 39 years and retired at the conclusion of the 2016 fall semester. 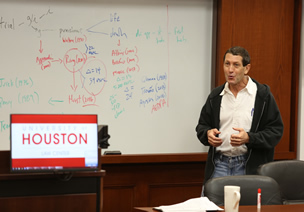 Professor David Dow provides a primer on death penalty cases to University of Houston Law Center alumni during Reunion Weekend. Dow, the Law Center's Cullen Professor of Law and a capital defense attorney, is the founder of the Texas Innocence Network which was established in 2000. In 2014, the Texas Innocence Network incorporated the Juvenile & Capital Advocacy Project (JCAP), which seeks to reduce juvenile delinquency and improve life outcomes for economically and socially disadvantaged youth through the provision of legal, educational and social support services. Dow gave an overview of recent developments in death penalty law, with special attention to Texas. He discussed what differentiates Texas from other states that practice capital punishment, including how juries are asked to foresee if a person would be a threat to the public if he or she isn't sentenced to death. "Texas is in a league of its own when it comes to deciding whether someone's going to be sentenced to death," Dow said. "What's peculiar about Texas as compared to every other state that has the death penalty is that the decision whether to sentence someone to death is not based on the facts of the crime itself, but instead based on the jury's prediction about what's going to happen in the future if the person isn't executed." Following the CLE sessions was an "Arbitration" Happy Hour where Law Center Dean Leonard M. Baynes introduced and celebrated five new faculty hires. Additional reunion events included gatherings for the classes of 1992 and 2007.